March 2014 - Whiteboard Consulting Group Inc. Many of you have asked about our Process of Coaching Course and what “experiential learning and simulations” as part of the second half of our day will be like. We explained it in a recent post this way: After lunch, we’ll bring an actor in to “play”. He will have a specific character, personality traits, and some previous past experiences built into his character. And in this segment you get to do the hardest part of applying coaching tools – PRACTICE. One-on-one you’ll get to work with the actor to go through the “Process of Coaching”. Every once in a while we’ll “FREEZE” we’ll have the room give you some tips and suggestions, get feedback from the actor on how he’s feeling, and get feedback from Ruth and me. 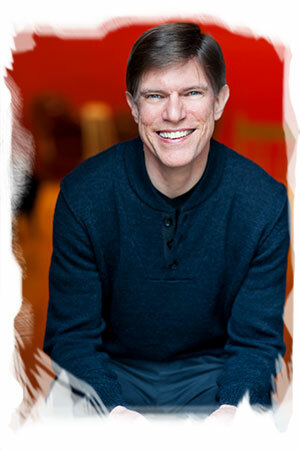 I thought more about how best to explain it, and who better than the expert and experiential leaning guru himself? Our fantastic colleague at playsthatwork, Peter Gardiner-Harding (say that three times fast! ), can share his thoughts on the subject?” So earlier this week I had the pleasure of speaking with Peter (furthermore known as PGH) to gain his insights. ND: So Peter, what IS experiential learning? How is it different than role-playing or simulation? PGH: To me, role-playing is like a “let’s pretend”, and simulation is a subset of experiential learning itself, which is a way to experience learning with the mind and heart. (Click to Tweet) Participants are fully engaged – not playing a role with someone else. They are doing the work in their own skin, with their own point of view, learning to integrate the new coaching skills into the way they coach. It’s here we use a professional actor who does the role-playing. The actor has the skills to portray a character and to deliver feedback so that learners have instant integration of their performance with their learning. ND: How did you get into this field? PGH: Although I started in business and became a CA, I was meant to be an actor. The combination of business and theatre is dramatic and meaningful, and I wanted to tell stories using my theatre and business backround together. ND: Who gets the most out of these simulations? PGH: The people who really thrive in this learning environment are those that are exceptionally emotionally intelligent, and self-reflective; people who are good at receiving feedback and seeking it. They levitate in these situations! (Click to Tweet) Everyone can benefit, but these people are the ones who who discover the most about themselves. And I believe that anyone who deals with other people in their jobs can glean a lot from learning to coach – IT software developer, for example, can learn to empathize with their users. ND: Why do people find it hard to coach? PGH: I would say the biggest barrier to effective coaching is when the coach has their own set of outcomes that drive the agenda for the coaching conversation. Keeping the coach’s outcomes out of the conservation is the key, so that the employee can self discover. It’s very difficult to straddle that line. 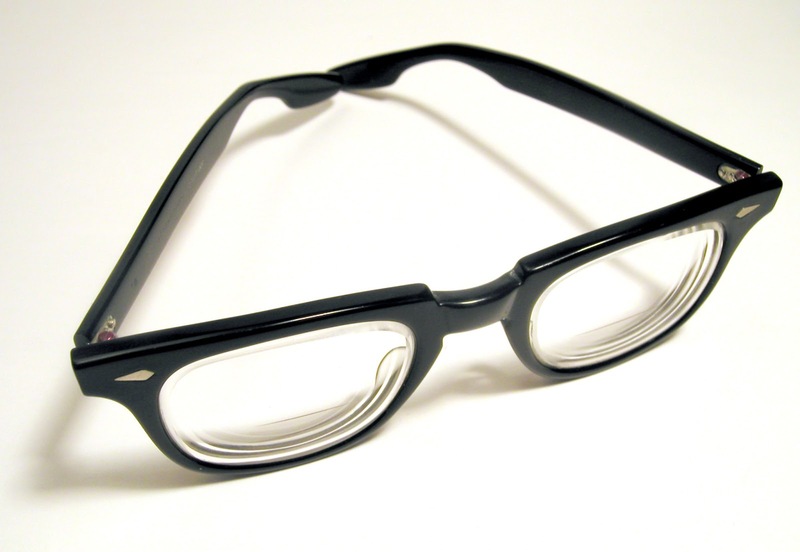 You can have outcomes and coach; you just have to be transparent about them. ND: What’s your favorite part of your job? I love seeing people come away from a simulation having experienced a transformative “a-ha” moment, when they actually see themselves and the results they get differently, something about themselves that they never noticed before. Some people have come away from simulations having changed their lives both professionally and personally. Want to learn more about the process of coaching and how we use experiential learning? 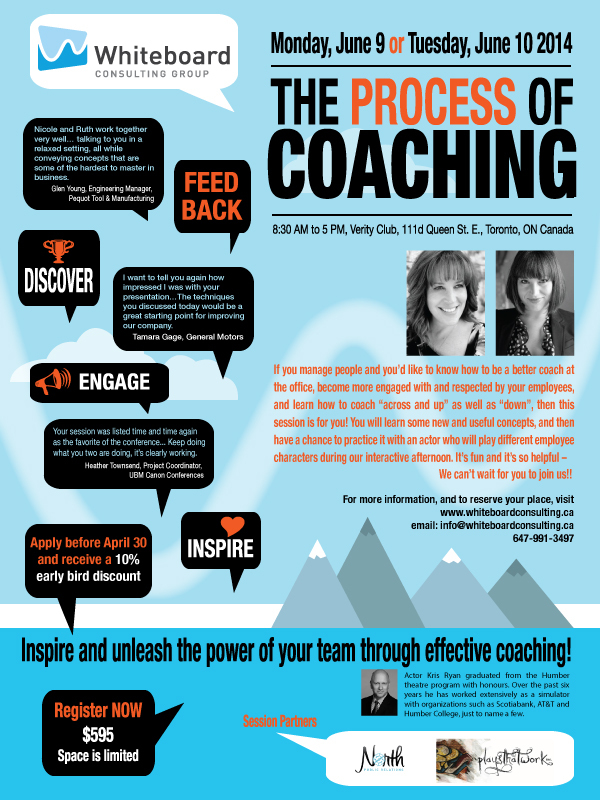 Give us a shout at info@whiteboardconsulting.ca/staging, or Tweet us at @whiteboardcons using the hashtag #processofcoaching. We’re so excited to see you all there! 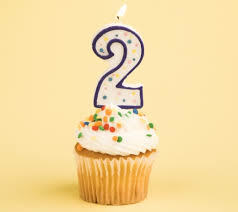 This week Whiteboard Consulting Group celebrates its second birthday, a real milestone for us! We love our work, and we are so glad we made the decision to start our business together. 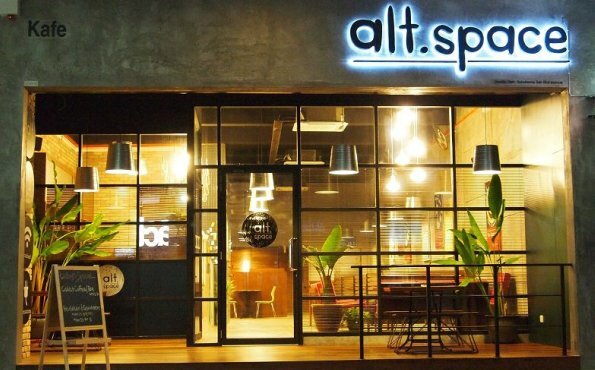 In the last two years we have learned a lot through experience and through our clients, we have laughed pretty much every single day, and we have never looked back. Thanks to our clients, present and past, who continue to amaze and delight us, and to our partners who continue to support our journey. You know who you are!! Here’s to the next two years and beyond! I was talking with a colleague in the insurance industry the other day, and, as often happens when discussing what we do at Whiteboard Consulting, the conversation turned to business processes, what they are, and where organizations can find them. At Whiteboard we recently engaged with Regus to use their gorgeous downtown Toronto workspace to host our upcoming course, The Process of Coaching. Regus helps businesses maximize the benefits of alternative work arrangements by providing access to the world’s biggest workspace network. If this type of service is available, why do so many organizations find alternative work arrangements difficult to manage? Do they do the same thing my colleague’s insurance clients do? “Hey everybody, we’re being flexible! Work from home! Yippee!” And then a month later when deadlines are missed and it’s impossible to find Employee X for an important call, it’s instantly revoked. Do they manage remote teams by having a conference call once in a while to go through action lists? Are they surprised later when individuals feel disengaged and isolated? That got the process geek in me thinking. Nicole, David, and I work from home and from office space at Regus. We have no problem with our productivity, meeting goals, staying connected with each other and with clients, and we have the flexibility to hit the gym in the middle of the day (or have a nap, if I’m being honest) if we want. The reason for our success in this area is that we have a process in place. If we didn’t, we’d be in trouble and we’d probably have to move to a formal office structure, which is not what we want to do right now. A while back Nicole wrote a blog posting on how processes don’t have to be big and showy, but you do have to have them! And if you look at some of the things that are bugging you at work (like unsuccessful alternative work arrangements) as processes, you’ll most likely be able to turn them around and make them work for you. Have you clearly defined who is eligible for flexible work arrangements and under what circumstances? Have you outlined the goals (which may be unique to each employee) expected out of each arrangement? Do you have a way to personalize your communications process? Do you use Skype or another similar program that allows virtual face-to-face interaction? Do you review the success of the arrangement on a regular basis? (more than annually) Do you have a way to modify if things aren’t working perfectly right away? The key is to have a process, discuss it with impacted people, communicate it, and stick to it. If you do, even complex situations like alternative work arrangements can work for your organization! This post is a short and sweet SNEAK PEEK into our: Process of Coaching course being offered on June 9 or 10 (register here) in the format of a FAQ! Note there is an early bird discount of 10% (on the registration website) and a special BNI members discount of 20% (email us for details) so, if you like a deal (and who doesn’t?) – get a deal! The people who will get the most from this course are people managers. Examples include supervisors, team-leads, managers, or directors that lead groups of people in the private or public sector. These leaders want to be just that – a leader, not just a manager. They want to evoke a spark in their teams that will increase productivity, unleash skills, and create a great culture. 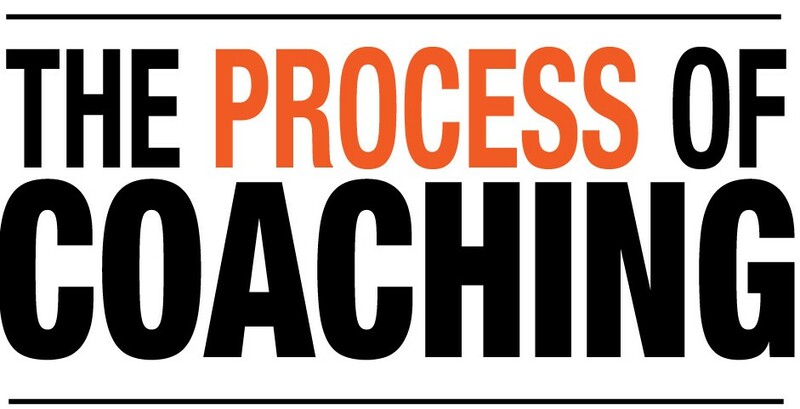 What exactly do you mean by “Process of Coaching”? If you read our blog a lot – you know we love to talk about coaching (link, link, link). We’re taking all of those tips, tricks, methods, and tools (along with more) and putting them into one simple process that you can apply to be a great coach every day. The morning portion of the course we will be teaching you our Process of Coaching that helps to build effective and collaborative relationships built on trust. This trust empowers multi-layered feedback and difficult conversations with accountability making sure that you get the most from your team. What is Experiential Learning? Who’s this Kris guy? Excellent question. We haven’t decided yet, but rest assured, between two gluten & dairy intolerants (Ruth and I), and our vegan project assistant David Keyes, we’ve got you covered. When you sign up, send us a note with any dietary restrictions and we will happily accommodate. Why is the dress code business casual? All of that real-live simulation means we need to be in an environment that means business. So, when you arrive, you’ll notice our fantastic space at the Verity Club, 111d Queen St E, Toronto, ON M5C 1S2 (www.verity.ca) – you have no choice but to get right into a business mood with that buzzing modern business environment surrounding you. Same goes for your outfit. Dress like you would when talking to your team at the office! Intrigued already? Sign up here to catch our early bird deal and join us for a fantastic day! Join us in our on-going conversation about coaching and office culture on Twitter, Facebook, and LinkedIn! I do not use the word “geek” pejoratively. No, I use it with fondness to describe those of us who have an aptitude for any subject that goes beyond the average person. You could be an astronomy geek, a food geek, a botany or gardening geek, a Shakespeare geek, a 70’s geek… anything! I – I’m proud to say – am a process geek. We love to see that side of people and let them know how awesome it is and how they can make it work for them. Wondering if you’re a process geek too? Wonder no more! You’re reading this blog. Face it – if you’re on Whiteboard’s website, you’re interested in learning more about us and what we are up to. And what we do (be it training, facilitation, or strategic planning) always comes down to process. It pains you to know how long your proposal will be in the approvals process at work, and you’ve already thought of three ways to make it faster. If only anyone would listen. You stand in line at coffee shops and think of ways the line could move faster. Want to get Nicole ranting? Ask her about how she feels now that Starbucks has moved to individual coffee preparation vs. batching. I, on the other hand, am dying to revamp Tim Horton’s meal combo ordering process so that people don’t have to repeat Every. Single. Item. Separately. And. Slowly. Although the voice is annoying, you secretly think stores that employ the audible call to open cashiers (Cashier Number Four Please) are genius. Not only does it save the cashiers from shouting “I can help you down here”, but it also moves the line along just that little bit faster. At airports you wonder about people who don’t yet understand the effective processes for passing through security (jacket off, belt and shoes off, laptop out, all before you get to the bins) or boarding a plane (slide into the seat, check if people are waiting to get by, then slide out and throw your carry on up top). You kind of like doing your taxes. Even just a little. The feeling of organizing all the files and filling out the online apps is quite satisfying (especially if you’re getting a refund). You can’t believe how much manual paperwork is required at the bank. In 2014. You have developed routines for mundane things in order to make them as quick and painless as possible – at home: packing the car for a roadtrip, housecleaning, packing lunches. At work: preparing a monthly report, doing performance reviews, starting a new project. When you have a great idea for something, you grab a piece of paper or a napkin and you sketch out the steps and how it will work. You number things and use arrows to show the flow of the idea. You’ve already thought of ten other ways that you’re a process geek. It’s not such a bad thing. Embrace the process geek in you and tell us about it! We’d love to help you make it work for you.